I have been changing nappies everyday for nearly four years and I have at least another year until I start potty training Holly. That is a lot of nappies! As they get older you also have to be quick, gone are the days where you can take your time, tickle their tummy and get those cute smiles. They want to be off playing, not led on the floor, that is boring. 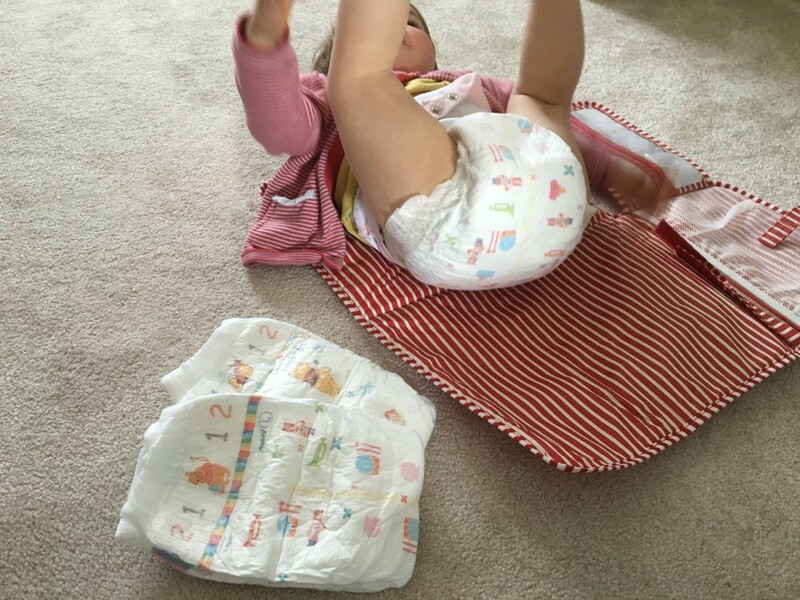 As Alice got older, she was a real wriggler and changing nappies was not fun or easy. Thankfully Holly is a bit easier and if you make it a game or give her a distraction (usually my phone), she will lie down happily and stay still. When it comes to what nappies to use, for me it’s all about does it leak. I have enough washing to do, without having to add clothes from a leaky nappy. I have recently seen lots of people talking about Japanese brands and they seem really popular. 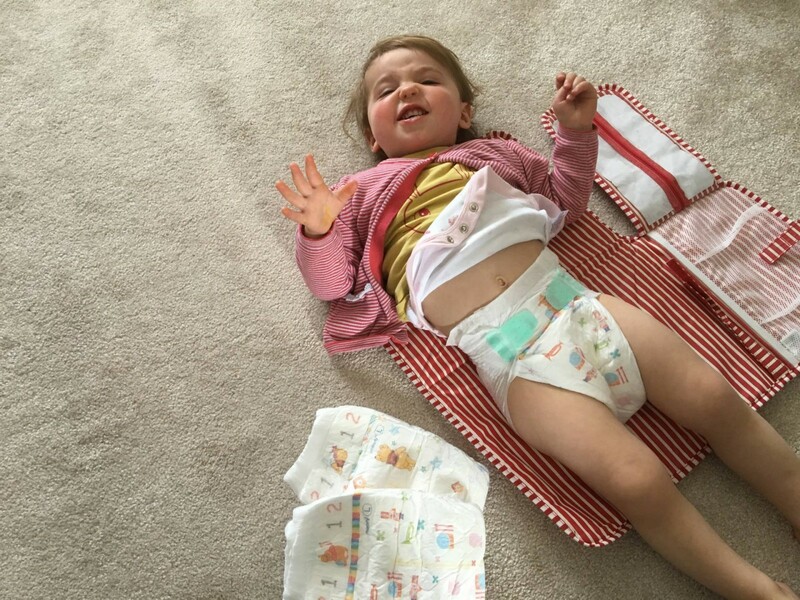 Japanese Nappies now sell them in the UK and they got in touch to ask if I would like to try their Moony nappies for review. I said yes, to see if they are as good as people say. Plus, they are offering a lucky reader to win some Japanese nappies too. 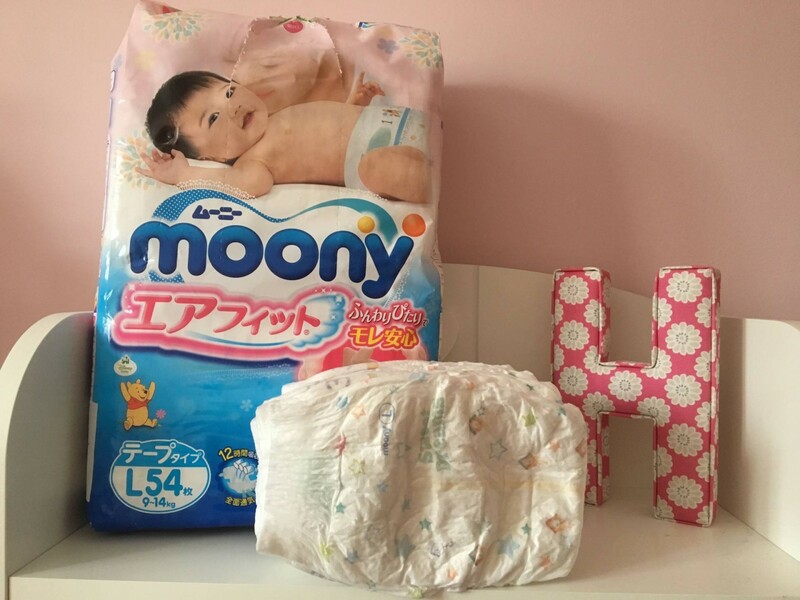 Moony are a brand from Japan and their nappies are made in Japan and they are receiving great reviews from parents. The design of them are really cute with Winnie the Pooh, trumpets and soldiers on them and they are really soft to touch, I mean really soft. A lot softer than any other nappy I have come across. 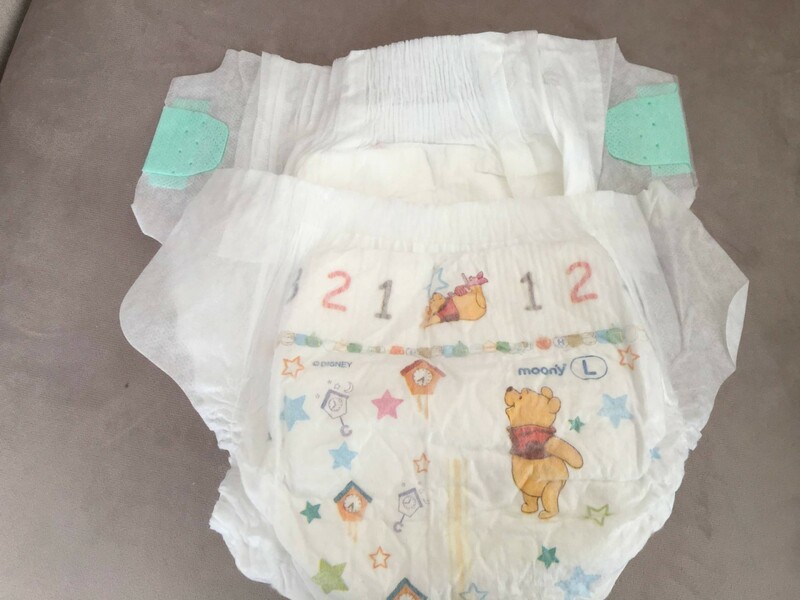 They come with a wetness indicator that changes to blue when it needs changing, I have only seen this on newborn nappies in the UK. Something I missed when Holly grew out of these. I love that the sticky velcro bits are green and stand out, as so many times when I am in hurry I put it on the wrong way and have to swap it round with an impatient Holly. Once the nappy was on and Holly started to run about, I noticed that I couldn’t tell she was wearing a nappy under her leggings, like I do with UK nappies. They are a lot slimmer and feel lighter. Holly was able to move freely about and they didn’t restrict her. The nappies come with a stretch band all the way round and the leg cuffs are soft too. Holly needed the L size, fitting babies and toddler weighing between 9-14kg. They fitted securely on her and I knew they weren’t going anywhere and I prayed for no leaks. We have been using them for a week now and I am pleased to say that there hasn’t been any leaks. Phew! They are more expensive than other nappies on the market, but the quality in my opinion is higher. You can find out more about Moony nappies at Japanese Nappies and the nappies are sold on Amazon. Disclosure: Japanese Nappies provided the nappies for the purpose of this review and giveaway, however all opinions are my own. I reviewed the pull up pant version of these recently and felt the same way as you, very slim and discreet but expensive. I’ve moved onto Lidl pull ups which are also thinner and less noticeable than the others on the market. The wetness indicator is great. They are also on the newborn range of pampers. Good luck, exciting times. 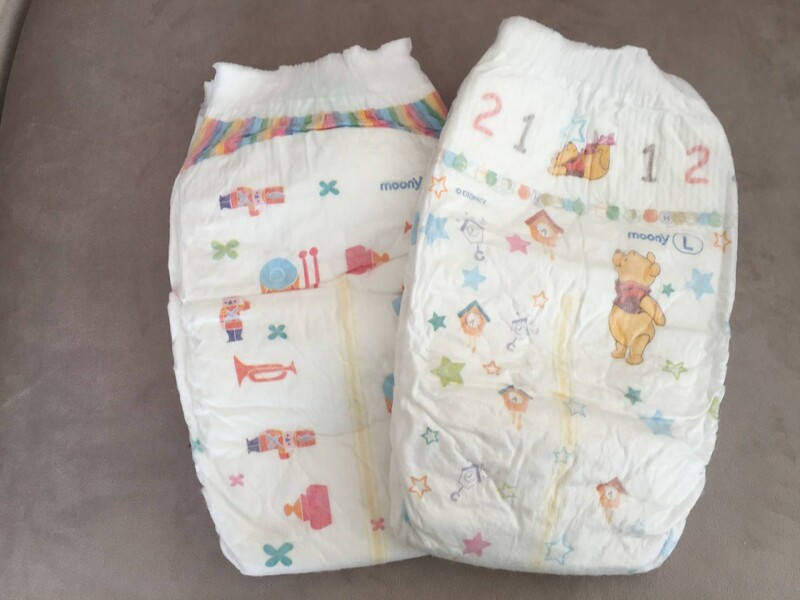 What is the nappies retail price? It is great that you cannot see them under clothing and the design is really cute! I had no idea that Japanese nappies were a thing! I would have tried these when mine were at that stage. Ha Ha, they are a new thing!